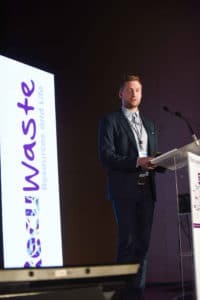 International Recuwaste conference took place on 8.-.9.10. in Barcelona. Over 50 speakers and 550 conference guests around the world attended the event. The conference has been arranged previously three times by the name Recuwatt. The name and the focus have been updated from recycling and energy towards circular economy. At the conference, Tuomas Räsänen gave a presentation about HSY, eco-industrial center Ekomo, other circular economy hubs in Finland and the CircHubs project under the conference theme circular economy success stories. Title of his presentation was “Helsinki. Circular Hubs, a new business model to build the circular economy”. The most important content of his presentation was to highlight the actions performed in order to develop circular economy centers. The conference enabled international sharing of the best practices found and used in Finland among resource efficiency. In the CircHubs project, circular economy hubs are acting as pilot platforms of research and development, companies and other stakeholders. Other themes at Recuwaste were resource economy, cities of the world, municipalities and waste management and innovations. The conference was bilingual. All the presentations were translated from Spanish to English or vice versa. And by the audience reactions, the translations were also working out very well. Several presentations and panel discussions invoked plenty of questions, says Tuomas Räsänen from HSY.